such as airplanes, automobiles and the so-called “Iron Horse”– the stagecoach was the best means of traversing this vast land, often traveling west to new opportunities in the expanding territories of our growing country. Pulled by teams of horses –their steadfast drivers intent on the safe and swift delivery of mail, goods, people and currency– each stage would stop for a time along the route allowing passengers to eat, rest, and be entertained at a cozy tavern or inn. There, the inn-keeper would provide valuable respite from rough roads, inclement weather, and oft-times dangerous travel. 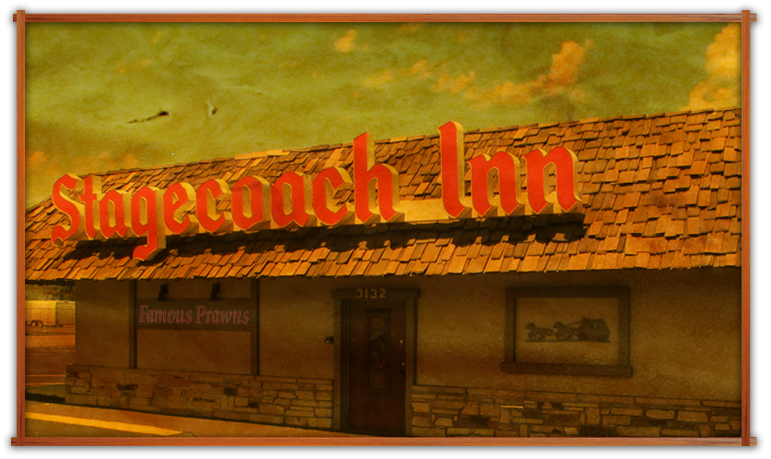 Known for its friendly hospitality, delicious steaks, famous prawns, and house-made desserts, the Stagecoach Inn has been a favorite dining destination in the Boise area since 1959. The now-iconic restaurant shares a certain kind of history with the original stagecoach inns and taverns that dotted the west in years past. 1959: Boise’s original Stagecoach Inn opens, attracting customers from far and wide, and quickly becoming a favored lounge and dining destination. Like his predecessors, wishing to offer a much-needed service along the trails, founder Willie Schrier was a hospitable and well-liked restaurateur, a colorful personality and a legendary story-teller. As host, Willie derived satisfaction and purpose in providing a warm and comfortable atmosphere where his guests would be served the best, most succulent western fare –fine steaks, famous prawns, tender prime rib, and home-made desserts. 2015: The Stagecoach Inn is brought back to life! Featuring popular dishes going back to 1959, our current menu is steeped in the tradition of the Inn, including many recipes created and perfected by the Schrier family. As in years past, the ‘Coach will continue to provide a comfortable, relaxed atmosphere, with delicious libations and hearty meals prepared and served by the best staff in the West. –along with our incredible staff and the Schrier family’s hard work, vision and dedication– has led to the Stagecoach Inn’s iconic status in the Boise Valley. Cheers to all who have contributed, in so many ways, large and small, to our enduring tradition of comfort, friendly hospitality, and great food!